Everyone knows what happened at Pearl Harbor on December 7, 1941. Battleship Row bore the brunt of the Japanese attack. 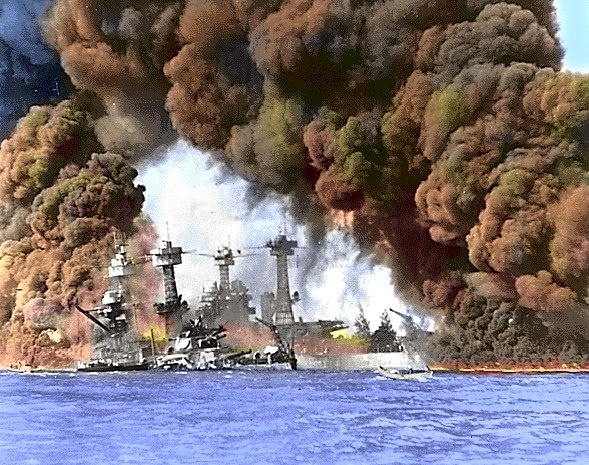 The USS Arizona blew up, the USS Oklahoma rolled over, the USS Nevada tried to make a run for open sea. Seven torpedoes and two bombs struck the USS West Virginia. The ship had been moored outboard of the USS Tennessee with forty feet of water below its keel. It sank at its berth, its superstructure still above water. Men were trapped below decks. In the immediate aftermath of the attack, rescue efforts got underway. Equipment was salvaged and distributed among other ships. Workers heard tapping, and believed survivors remained trapped. Officers said they heard debris sloshing around. Finally, holes were matted, water pumped out, and on May 17, Wee-Vee was floating again, five months after the attack. Seventy bodies were found, including several lying on steam pipes in an aft engine room where they survived briefly in an air pocket. Storeroom, A-111, was opened. Only three feet of water had gotten into this room. Lying on shelves were the bodies of three men: Louis Costin, 21, Clifford Olds, 20, and Ronald Endicott, 18. They’d had emergency rations and a fresh water tank. They’d marked off days on a calendar with a red pencil, from December 7 to December 23. They all wore watches to keep track of the time. Their families were told they died December 7. Eventually siblings learned the truth, but didn't tell their parents. What did those three young men do for those sixteen days? Did they know what had happened? Could they guess America had been attacked and was now at war? General Quarters had sounded at 0755, quickly followed by two heavy shocks, causing the ship to list to port. Did they feel the ship settle on the harbor bottom? Did they wonder about their shipmates? Did they know many were killed? They must have heard the salvage efforts. Had they done the rapping heard by the salvagers? How often were hopes raised of eminent rescue, only to be dashed as silence once again surrounded them? Were they afraid? What filled their thoughts through sixteen long days? They must have ached to see their families and homes. Did they share their reminiscences? Had the three been close friends, acquaintances, or strangers before the Japanese imprisoned them in the storage room? Did they speculate on events going on beyond their iron tomb? Did they realize their air was finally running out? Did they ponder their afterlife? Did they pray? Did they curse? What was it like to be so close to the freedom of living, and be doomed? Wow! How awful for those men! So many questions that will never be answered. Good article.